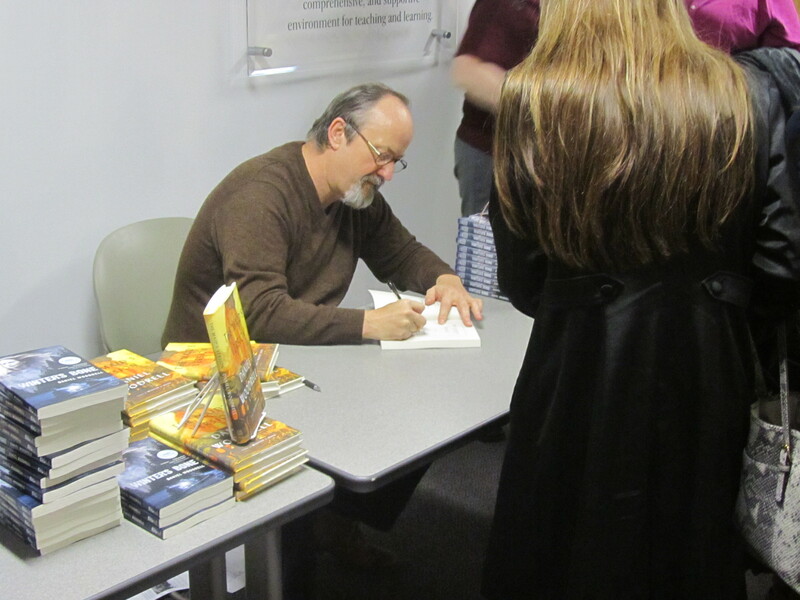 Acclaimed Missouri author visits SCC campus. On Thursday, February 20, over one hundred members of the SCC staff, students and members of the community converged in the SSB Auditorium to listen to guest speaker Daniel Woodrell.Woodrell, 60, has written 10 books, several of which have gone on to receive critical acclaim. So far two of his books have been adapted into feature length films: 1999’s “Ride with the Devil,” which starred Tobey Maguire, is an adaptation of Woodrell’s “Woe to Live On” and 2010’s “Winter’s Bone” is based on the novel of the same name and starred, a then relatively unknown, Jennifer Lawrence. After the readings, Woodrell took questions from the audience, an audience that wasn’t shy in asking him about his Hollywood experiences. He also admitted that he was a high school dropout and his writing process starts with him writing out longhand. When asked which famous authors he enjoyed growing up he said that he “was shoved towards [Mark] Twain” as a child by his mother. After the brief Q and A session, Woodrell signed autographs for those who brought their own copies of his work, or purchased a copy at the event. The audience was diverse in both age and ethnicity and ranged from SCC Students seeking extra credit, such as freshman Amanda Sauter, to senior citizens who walked in holding their books and left clutching them to the chest. Additionally, there were a handful of amateur writers who smiled as they listened to the locally based literary hero. Overall reaction to the guest speaker was positive. Freshman Samantha Schoonover said, “To see from his starting point to how he’s become to be [a famous author]” was “motivational.” Considering Woodrell’s humble beginnings to where he is today in his career this is a fair statement. It would be fair to say that many probably came to hear Daniel Woodrell not knowing what to expect, but all left a little more inspired. Missouri is a state that is no stranger to famous residents; however it is refreshing to know at least one still calls it home.